Franklin Church, built in 1841, is an out-of-the-way jewel in the Holmes County countryside south of Lexington. I posted about it here back in February. A reader brought my post to the attention of Julian Watson, one of the church’s members and a leader in efforts to preserve it and the heritage of its membership. He invited my wife and me to attend and enjoy the church’s annual Homecoming on April 23, 2017. And so we found ourselves in the embrace of this country church on the holy day of its family reunion. They made us welcome to their worship, music, food and fellowship. 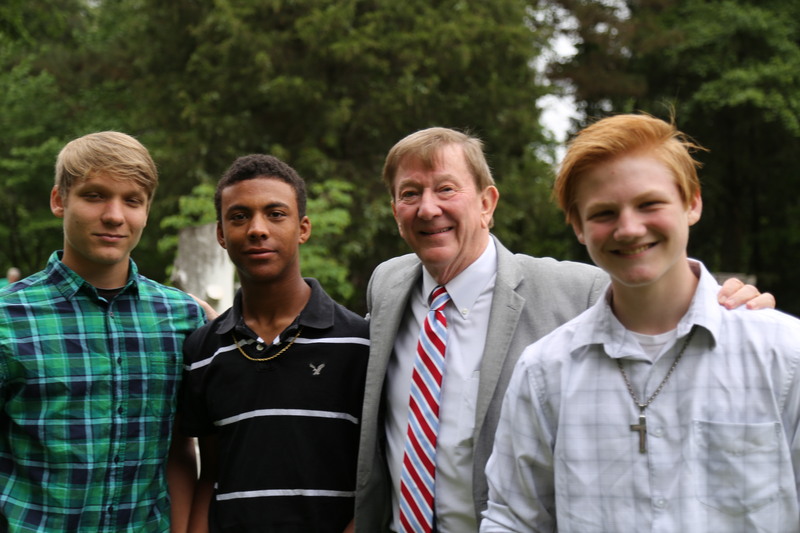 As the throng gathered, Mr. Watson welcomed three students from nearby French Camp Academy. Musicians rehearsed, and then played hymns that provided a segue into the service. Ms. Virginia Dickinson, who worked to get the church ready for the event, addressed the congregation. The preacher came from French Camp and led the worship. Then it was time for the food. It was too cool and damp for dinner on the grounds, so the church became a dining hall. At Homecoming in a country church, communion is breaking bread together, with fried chicken, strawberry cake, macaroni and cheese, ham, cabbage, pulled pork, pecan pie, brownies, ice box pie, sweet tea, and shared abundance. And then, too soon, it was over, and we headed home to Meridian, our thoughts full of the special spirit of this place. There is a Homecoming here every year the Sunday after Easter. It’s the only service held at Franklin Church during the year. There’s no longer any local congregation. Almost all of the member families have moved to other communities and even other states, but they strive to make Homecoming. Homecoming happens every Sunday somewhere at churches across Mississippi. It’s in Mississippi DNA to try to keep the past from dying, to bring it into the present to look at, breathe life into it, and help others, particularly young ones, understand it. That’s what Will Faulkner of Oxford was trying to tell us when he wrote, “The past is never dead; it’s not even past.” Sometimes Mississippians romanticize and clean up the past, even when it is dark and malevolent, but always the past is respected and even revered. Some people say that Mississippians live in the past. I think that’s incorrect. I think Mississippians live in the present, but want the past to co-exist with it. That can be a beautiful thing, and sometimes not. At Homecoming in Franklin, it’s a beautiful thing. Too often I’m aggravated because of the various inept, corrupt or just plain boneheaded folks in our great state. But then something like this reminds why Mississippi is so special: good people enjoying good fellowship because. . . well, just because. Thank you for posting! Warmed my heart and made me smile after a long week. You are currently reading Homecoming at Franklin Church at The Better Chancery Practice Blog.